It was bad news for spectators, riders and retailers when organisers announced the cancellation of Badminton Horse Trials due to the relentless rain. Us horsey folk are now left with time to spare and a horsey shopping itch you just gotta scratch! And it just so happens that equestrian retailers are now left with surplus stock to clear. 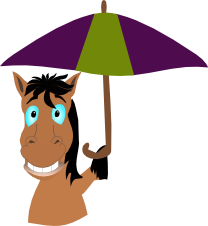 So come under the Equine Compare umbrella and grab yourself a Badminton Bargain in the comfort of your own home. 15% off all Fine Art Equine Studio Photoshoot packages with no mileage costs. This offer covers the whole of the UK. … PLUS LOTS MORE ONLINE! 10% off limited Badminton stocks. Badminton promotions available instore until 7th May, while our Badminton stocks last! Various discounts on all our most popular numnahs. 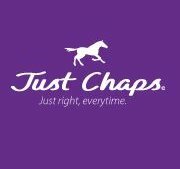 NEW WEBSITE with largest range of Half and Full chaps on the market. We are honouring our free gift coupon in Horse and Hound, just email us the stand number and we will send the gift with your order. Click here to view our new equestrian products, which were being exclusively launched at Badminton. The cushions measure 17" x 13" and cost £39.00. Links of London are the creators of the Official Jewellery Collection of London 2012 so they've designed this special red and blue woven band with an engraved plate in celebration of the Games. 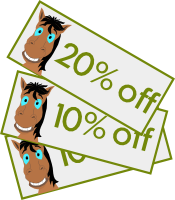 10% discount this weekend due to cancellation of Badminton. Find bigger Badminton offers on the SALE page. When you click on the checkout 10% of your bill will be deducted. Our virtual Badminton tradestand is up and running. Find end of line items and discontinued styles that we would have taken to Badminton Horse Trials + free postage. Following news of Badminton's cancellation, H&H readers can still claim special discounts from our partners via our 'virtual shopping village'. These offers are available to UK purchasers only, unless otherwise stated. 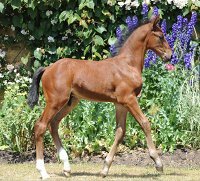 Visit World of Horses to see a virtual display of all their exhibitors. Use the link at the bottom of the homepage. Several of their exhibitors are running offers, and there is still an opportunity to enter their grand prize draw.